Why TPLF devised ethnic federalism proved to be the main crisis escalator rather than a crisis damper in Ethiopia? Ethiopia is the only country in the world that uses ethnicity as the fundamental organizing principle of a federal system of government. Among about the 200 world countries, only around 20 countries implement federal system of government but none of them use ethnicity as the fundamental organizing principle of their federal system of government like Ethiopia. Many political leaders in Africa at present are not willing to implement ethnic federalism perceiving it as the continuation of “divide and rule” policy implemented during colonial time and also fearing that it reinforces tribalism. In 1994, the Tigrayan People’s Liberation Front (TPLF) implemented in Ethiopia a federal system based on ethno-linguistically defined regions and a strict “ethnicization” policy. Since then, there has been growing discontent with the TPLF’s ethnically defined state and rigid grip on power and fears of continued inter-ethnic conflict. Many Ethiopians fear the ethnic awareness and tensions created by the regionalization policy and their potentially explosive consequences. TPLF claimed its “ethnic federalism” system will empower tribes without dividing Ethiopians. But today, Ethiopia is the most ethnically divided country in the world. Ethnic hatred, propaganda and tensions today are the highest ever in history. Just like the 1990s Rwanda, tribalism has destroyed Ethiopian nationalism and humanity. No single Ethiopian, whether rich or poor, educated or not, feel that he has a country to live together in peace and harmony with others. There is serious rivalry among the ethnic groups over issues such as fair share of the nation’s resources and political power. When it came to power in 1991, TPLF has lied to Ethiopians that it will achieve the following top five policies such as creating good relations with Eritrea, avoiding drought and famine, Improving Ethiopian economy, creating political reform and democratization. But after 23 years of time, none of the above policies are achieved. In fact it is the TPLF’s disastrous policy which made Ethiopia the largest landlocked country in the world. Every year, Ethiopia has been paying over a billion dollar to the tiny neighboring Djibouti to import and export its goods. This sum of money could have created a job and saved the lives of thousands of Ethiopians who lost their precious lives while crossing the Mediterranean and Red Sea in search of better life and freedom. It is clear that the Tigray People’s Liberation Front (TPLF) continuous torture, killing, ethnic cleansing, incarceration, blocking of the free press, jailing journalists and political activists, has reached a point where it is irreversible. All the peaceful ways of struggle for freedom in Ethiopia are closed. The recent attacks on the anti-ISIL protestors in Addis Ababa, the Blue Party, the Unity for Democracy party (UDJ), All Ethiopian Unity Party (AEUP) and the imprisonment of the peaceful zone-9 bloggers and many others are manifestations of the totalitarianism of the TPLF junta that has controlled Ethiopia for the last two decades. The political, economy and military control by a TPLF ethnic minority, the unprecedented increase in human rights violations against the Ethiopian people, especially of the youth, have made them choose mass exodus to be their ultimate choice. Since 1991, hundreds of thousands have fled Ethiopia. Ethiopia is also amongst the worst hit in a brain-drain, seeing mass migration of its skilled professional. TPLF is leading the country into an era of darkness. A country with a broken justice system, a rubber stamp parliament, a military that doesn’t stand for the people, a press controlled by dictators is soon or later be a failed state. The Ethiopian people are aware of this. And TPLF’s hopeless measures are indications that the struggle for saving this country from a free fall is at its climax. The Ethiopian youth is now more politically active than before. Thanks for independent medias like the Ethiopian Satellite Television (ESAT) and other social medias, Ethiopians are now aware of the systematic ethnic cleansing of the Amhara by evicting them from their lands, the indiscriminate killing of the Annuak, the unprecedented torture of the Ogaden people, the day light shooting of peaceful Oromo students protesters. 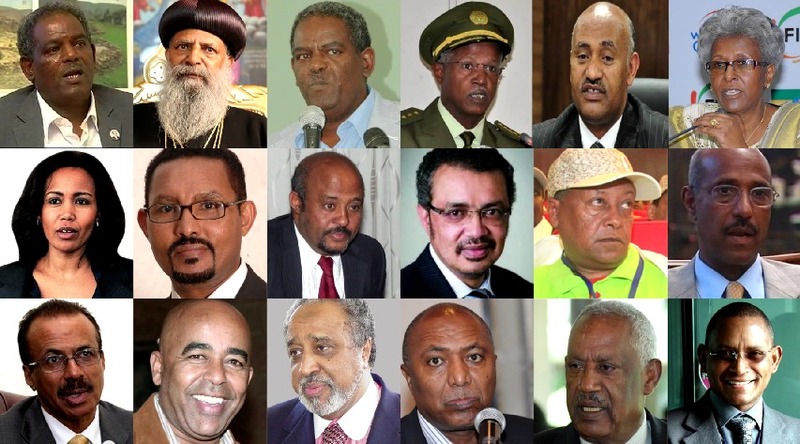 Ethiopians are now aware that out of the 63 generals in the military, 61 are from an ethnic minority. Ethiopians are aware of the desperate acts of gross human rights violations of the TPLF regime. Ethiopians are aware of the imprisonment of journalists such as Eskinder Nega, Riot Alemu, Temesgen Desalegn and many others for expressing their views. Ethiopians are aware of the monopolization of the economy by TPLF owned Endowment Fund for Rehabilitation of Tigray (EFORT). While TPLF knows the Ethiopian youth is aware of what is going on in their country, they are taking desperate steps. The recent illegal arrest and extradition of Andargachew Tsige (the secretary general of Ginbot 7 for freedom and justice) from Yemen to Ethiopia was against the Vienna Convention. All these injustice made by the TPLF have bred an Ethiopian youth that wants to struggle for their freedom and for freedom of their people. The recent defection of two MI-35 air force pilots with their helicopter to Eritrea, Hailemedhin Abera’s (co-pilot of Boeing 767) decision to reroute the Ethiopian airline to Switzerland and asked asylum in Geneva and other air force pilots that defect to Kenya are some of the symptoms of the Ethiopian youths’ determination to fight for freedom in Ethiopia. Upon observing all the options, fellow Ethiopians at home and in the Diaspora have shown strong interest to rise up in unison against this brutal regime and fight for freedom of all political prisoners, journalists and Ethiopian people who are inhumanly suffering in Ethiopia. The international community should take Ethiopia’s governance problems much more seriously and adopt a more principled position towards the government. Without genuine multi-party democracy and sense of unity among citizens, the tensions and pressures in Ethiopia’s polities will only grow, greatly increasing the possibility of a violent eruption that would destabilize the country and region.